Cooler temperatures are on the way and fall is just around the corner. This means it is time to trade in your tank tops and flip flops for your sweaters and scarves. If you have limited storage space or a huge wardrobe, you may struggle to find places to store all of your clothing. Transitioning your clothes and linens between the summer and winter months will allow you to take back control of your closet! You will be amazed at how organized and efficient this system is. 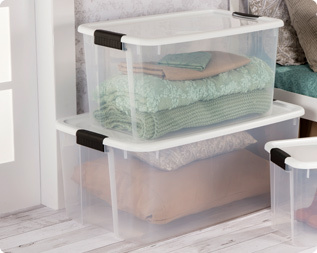 Sterilite can help convert spaces around your home into productive storage solutions for this seasonal transition. A closet is not designed nor intended to store four seasons worth of clothing. Most closets are only big enough to hold the clothes you are going to wear for the coming months. Therefore, to optimize your space and control the closet chaos, it is best to utilize the area under your bed for your off-season items. 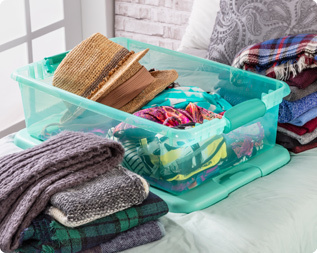 With Sterilite's Fresh Scent Boxes, you will be able to tackle this seasonal clothing swap with ease. However, before you start packing away your summer clothes, it is important to sort through each piece. Do you still like it? Does it fit? Are you going to wear it next year or are you sick of it? Make a donation pile for anything that you do not want, and everything else can be packed away until next summer. The 32 Quart Fresh Scent Box and 56 Quart Wheeled Fresh Scent Box are ideal for storing your seasonal clothing items. Simply place a dryer sheet in the innovative ventilation compartment and it will keep your clothes smelling fresh for months. When you take out your tank tops and sun dresses next summer, they will still have that "just-washed" scent! The best part of this system is that you can use these same Fresh Scent Boxes for both seasons. As you unpack your winter clothes and put them in the closet, you can repack the same container with your summer clothes to store under your bed. Bedding, blankets, and linens tend to change with the seasons. Thick comforters and warm fuzzy blankets are ideal for the winter, while thin bedding and cool sheets are best for the summer. Before storing away your linens from this season, take the time to wash or dry clean them so they will be fresh and ready to use when they are unpacked. 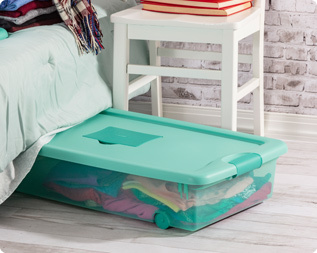 The Sterilite 70 Quart Ultra™ Storage Box is great for your smaller, more compact items such as sheets, pillowcases, and blankets. Whereas the 116 Quart Ultra™ Storage Box is perfect for large bulky comforters and decorative pillows. The durability of this product line makes it an ideal solution for storing away seasonal items in the attic or basement. The easiest way to combat the shoe clutter is to put a system in place. There is no need to have sandals out in the middle of winter, and boots laying around the house in the summer. The first and most important step is to get rid of all those cardboard shoeboxes. Switching over to clear storage boxes will make it a lot easier to find the shoes you are looking for. The Sterilite 6 Quart Latching Box is the ideal size for sandals, sneakers, and flats while the 16 Quart Latching Box and 25 Quart Latching Box are great for larger shoes such as winter boots and men's shoes. 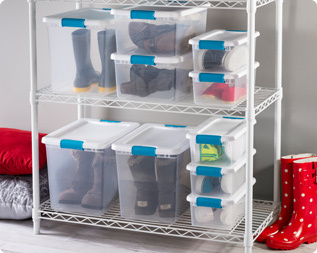 The hinging lids make it easy to access your shoes with just one hand and the indexed lid allows multiple boxes to be stacked to maximize the vertical closet space. The shoes that are out of season can also be stored in these latching boxes and packed away in the attic or basement. Transitioning your summer wardrobe in preparation for sweater weather should not be a chore. With a little help from Sterilite, you will be ready to jump into the new season with ease! Storing your off-season clothes under your bed maximizes that unused space and eliminates the chaos in your closet. As you unpack your winter clothes and put them in the closet, you can repack the same container with your summer clothes to store under your bed. As the seasons change, so does your bedding. Sterilite's Ultra™ Boxes are perfect for storing away your blankets, pillows, and sheets. By getting rid of cardboard boxes and switching over to clear storage boxes, your shoes will be easy to find and always accessible.